Software Internationalization Products - Kokusaika JP Inc.
Kokusaika JP condenses and provides its various experience and knowledge about software internationalization(I18N) and multilingualization as their products. These products are utilized for Kokusaika JP's own services, and give much power to customers' development and business sites. Try the amazing functions of our standard software internationalization and multilingualizaion tools! World Wide Navi (abbreviation: wwnavi) is a software internationalization tool that analyzes the source codes, modifies them, test the executable, and does others. Analysis rules can be customized for your various needs and not just for internationalization, such as programming styles and porting restrictions. World Wide Navi runs on both Linux and Windows and it can be used in various situations available in three User Interfaces (original GUI, Eclipse plugin, Visual Studio addin, and command line). 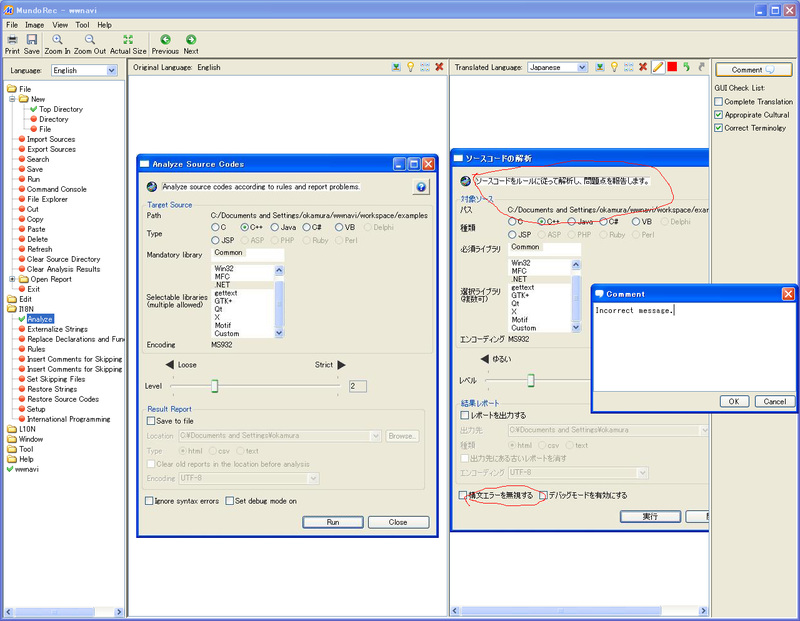 Internationalized (I18N) software can be localized (L10N) by Sisulizer effectively. Sisulizer is the next generation software localization tool. When you localize your applications and make them available in new languages, you open new markets and new revenue streams. Sisulizer lets you increase profits by making it easy to offer your software in multiple languages. With World Wide Navi, consistent process of Internationalization (I18N) -> Localization (L10N) can be realized effectively.